Karma Se7en - Tragus piercings - Cherry Colors - Cosmetics Heaven! I love piercings. Everyone (probably) knows that. And now I have quite a collection of them, some are from Karma Se7en. Back at the start of the year, I received a couple of piercings from them, some were from my septum (post is here) and the others are these, for my tragus. The thing is - I had the pictures already taken, but when my PC went to hell, with it went my pictures. That means that I had to retake them. But in the meantime, my super silver, and sparkly piercings became dark gray and not so sparkly. What happened?! They oxidized. Because they're made from silver. But let's take a look of all the four piercings I got, alright? 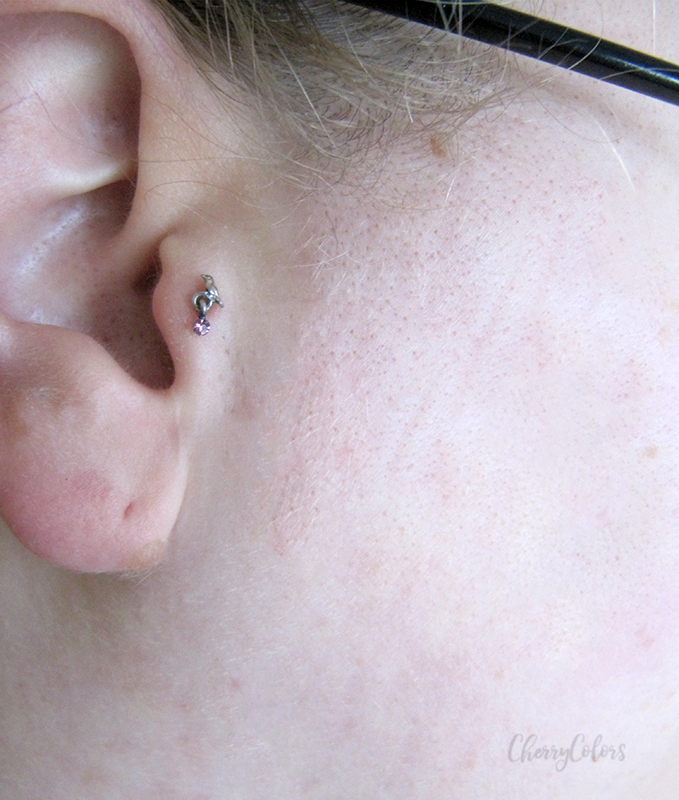 Are you searching for a distinctive tragus stud which exudes superb quality? Then this Lilac Hummingbird Tragus Earring is an inspired choice. Its stunning 925 Sterling Silver hummingbird motif has a small lilac dangling jewel, which gives your piercing that extra sparkle and vitality. I was super excited to get this one, I mean it's so cute, so dainty, so small. I am talking about the photo from their site, here. In real life, it's even smaller. Cuter. But so hard to take photos of! Also, because it's so small, you can't really see what it is, from far away. And it's also quite hard to center the little bird so it looks cool and nice :). But it si lightweight and didn't bother me during my sleep. And except for the oxidizing, I like it. 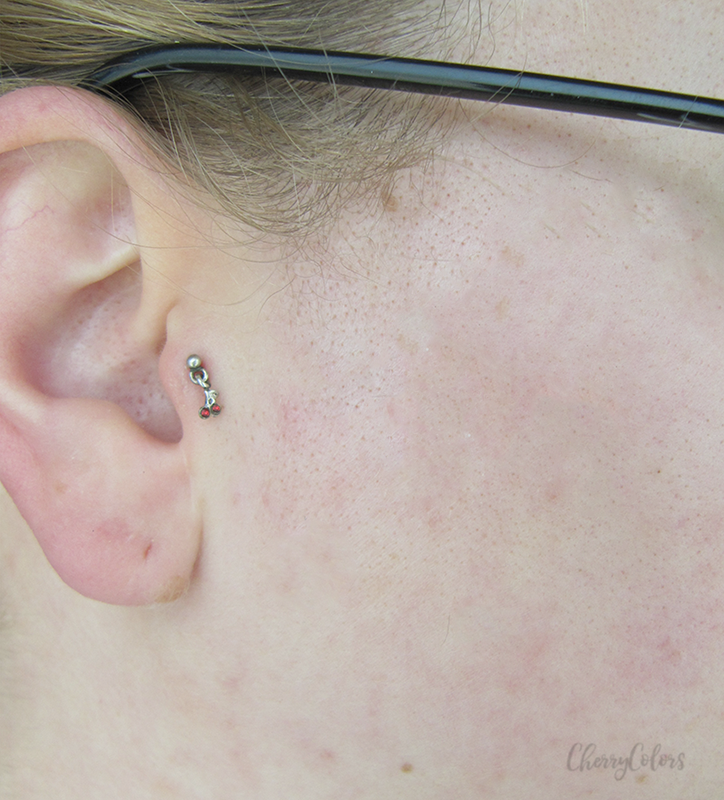 Does your tragus piercing need something a bit different that will really make it stand out from the crowd? Our Red Cherry Tragus Earring is the exciting piece of body jewellery that can do just that. The red cherry design is made from 925 sterling silver and has two radiant red jewels that add a bit of sparkle to your piercing. The cherry motif swings and sways around as you move, twinkling as it catches the light. This has to be one of the earrings I was the most excited about. Why? Because of the cherries. I love cherries! It's small and I couldn't really wear it because the steam of the piercing was longer than the bioplast part (where you insert the little decal). But that didn't stop me, no. Unfortunately, one of the stones fell out when I did the recommended cleansing (to get the oxidized color off). That's really too bad because I totally wanted to wear a cherry themed tragus piercing ;). 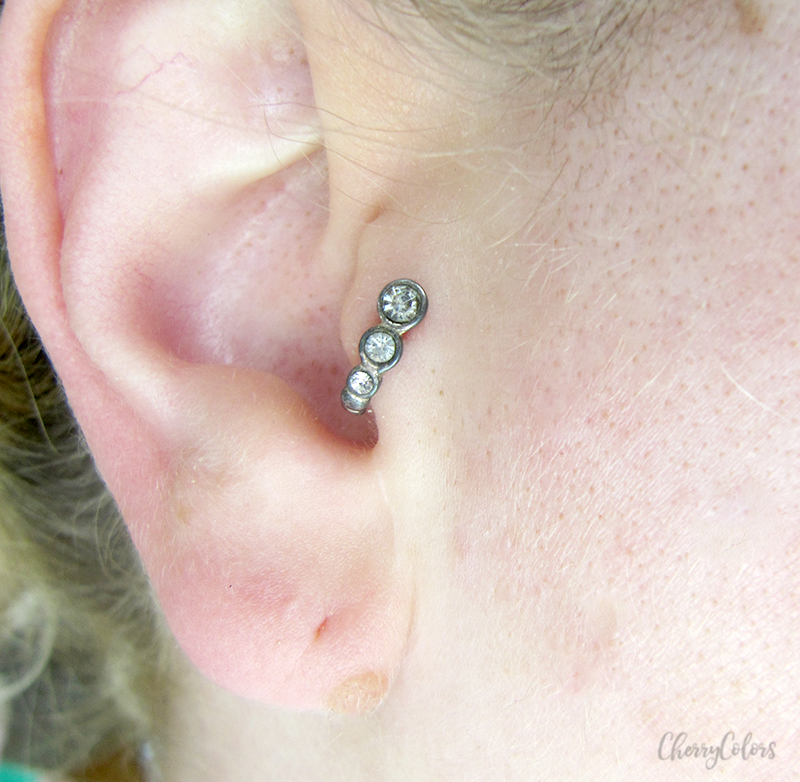 The Clear Jewelled Tragus Cuff is a spectacular tragus stud that will light up any tragus piercing. Its elegantly set clear gems gives this piece of body jewellery an unmatchable excellence that will also make sure that your piercing is looking its best. Do you know that I really like sparkling stuff? And cuffs seemed something very interesting. I never had such a cuff so I was really happy when the people over from Karma Se7en agreed to send me a couple. 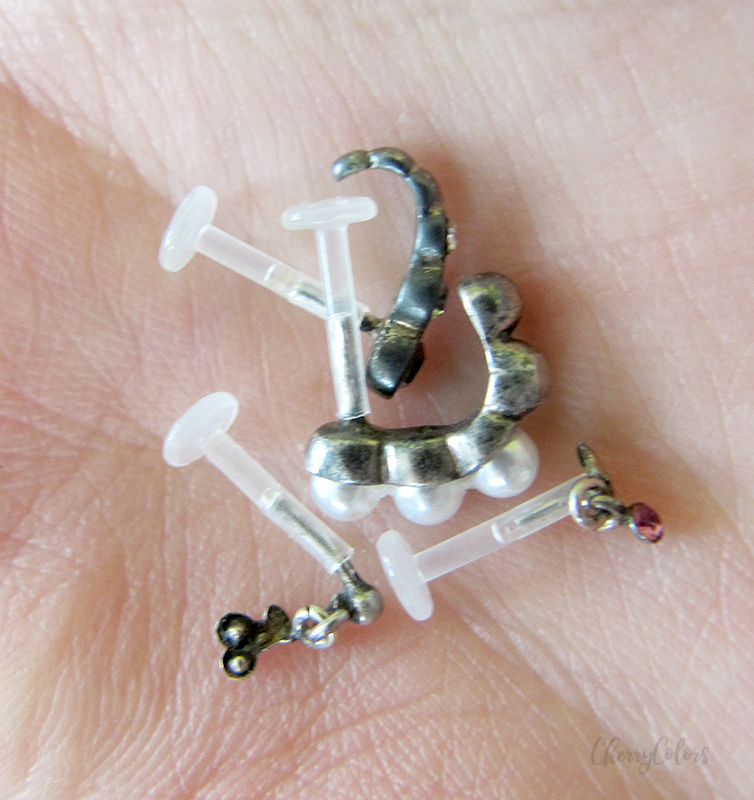 The cuff is made from two parts - one is the silver cuff with rhinestones and the second is a regular bioplast labret pin. You can find the official photos here. Everything fit nicely and snugly, so normally, I went to sleep with the cuff for a couple of times. My tragus hated that. It became irritated and it took me about 2 months to get it back to normal. So guys, no sleeping with cuffs! This amazingly sweet and enticing Pearl Tragus Cuff is an extraordinary and special piece of tragus jewellery. 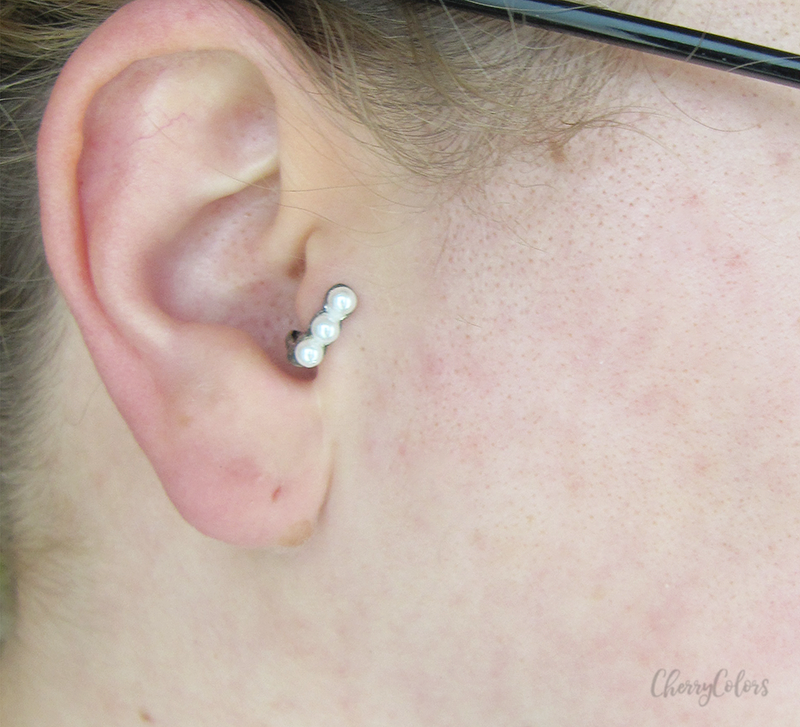 The Pearl Tragus Cuff has been designed and crafted with top quality Sterling Silver and has been set with three eloquent and classy looking pearls, you will be sure to gain some compliments on your tragus piercing. Pearls, the product of the sea... they make me a bit nostalgic. I miss the sea. Of course, having pearls in your ears is probably the next best thing to being at the seaside. Or maybe not. But I did like the idea of them and the cuff was so pretty. Again, it's one of the things that you shouldn't sleep with because your tragus will hate it. At least mine did. Sadly, as all of them, this one did also oxidize. Otherwise, I'd wear it regularly. I do like bioflex stems, but I realized that I do prefer the ones made from different materials, like titanium or niobium. So I'll stick to those. Sadly these oxidized badly, even when I cleaned them once and that made me very disappointed. It's a first for me and hopefully the last time. It's terrible seeing such pretty, sparkly stuff become so dull.